We studied this poem in school and I'll never forget our teacher reading it off as written in the Scottish-y dialect that only Robert Burns ever seemed to get away with. In fact, I hear this line in my head, in her voice, to this day (many many years later) when plans don't go as I had expected. I hear it in my head now. My plan for Finish for Fall included a Total Organization of ALL Yarn and Yarn-Related Items. It was a good plan, and while I did make progress, I didn't make all the progress I had wanted to make. I have to decide that, for now, this is OK. I managed to complete some projects, frog some others, and recover many needles and stitch markers. I donated a bag of yarn and accessories and I ended up with a bag full of now empty knitting bags. I also have the resolve to not fill all those bags back up with half-finished work, then shove them in the closet. To date, of the 14 projects I found, only 4 remain. They are on the back burner, but having seen them recently, I can't soon forget them. And it's OK. The journey is sometimes as important as the destination, and in this case, the fact that I was able to travel on this journey with YOU made it special and I am extremely glad to have undertaken it. ***Less Scottish: "The best-laid plans of mice and men often go awry." I found 14 projects tucked away (2 not pictured). That's a lot of unfinished business! 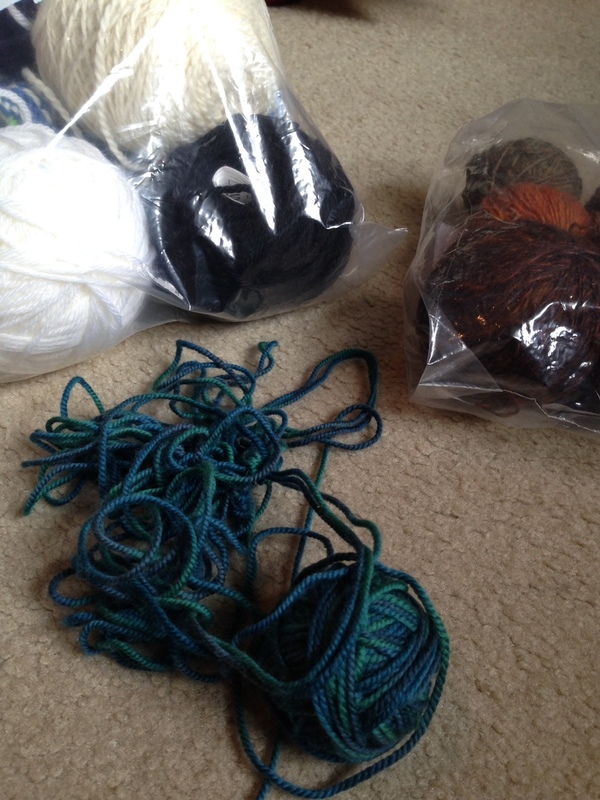 My progress was slowed by the constant need to stop and untangle yarn balls. 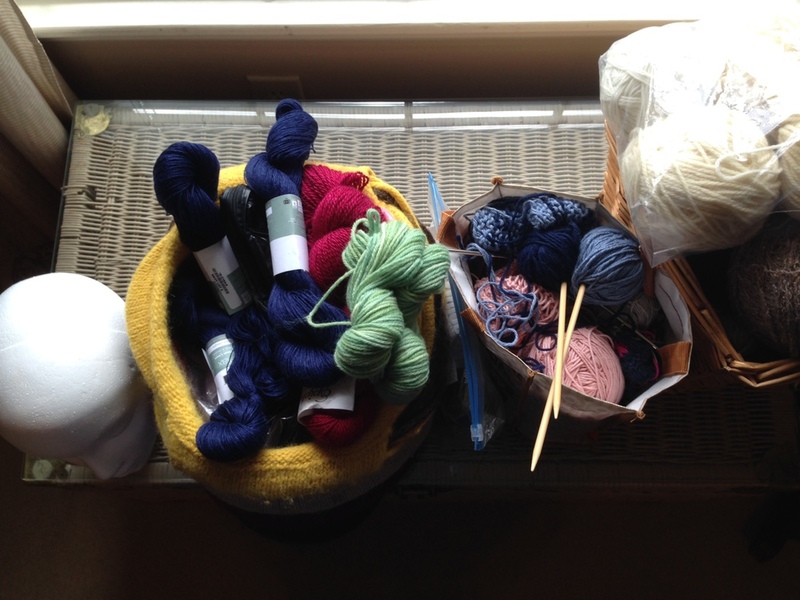 By the time I was through getting it all organized, I had one bag of yarn to put away, one bag of knitting projects to finish and a basket of odd-ball yarn to make decisions about. And a head, but that's a story for another day. 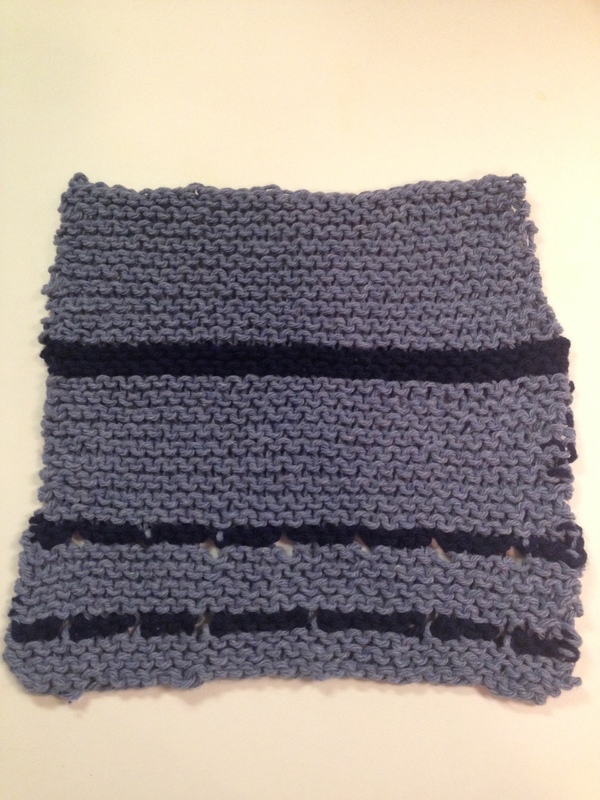 Since that first day of digging it all out, I have frogged 6 projects, bound off one where it was (it was a swatch)(sorta), and completed the knitting on both a random dishcloth and the Charleston Indigo Scarf. 14 - 9 = 5! I now have a very full tin of stitch markers, several more sets of needles and an abundant supply of row counters that had all been "in use" for years in some cases. There is still much to do, of course, and I know I will be casting on new projects (for new designs I'm writing) long before I finish my Cold Mountain shawl or some of the other projects still on needles. That's why my list is coming in handy. The next step for me is to develop my time-table for finishing that big project and even more importantly, to stay "solvent". My plan to Finish for Fall has given me a new resolve to not let things languish or get pushed aside into a dark closet or drawer. I started this beaded wrap several years ago. Frogged! I started this random dishcloth (what were those eyelets all about??) last spring. Finished!! How about you? Did you start this Finish for Fall project, too? How is it going? Is it helping? I'd love to hear about it. If you feel brave, share with us in the Ravelry group. If you're too mortified by how much you found lurking in the shadows, post an anonymous comment and know that you're not alone. We'll go step by step over the next few weeks, tackling with diligence those unfinished objects (UFO's in knitter-speak) until we will end up with finished projects, more room in our knitting storage areas, and a sense of accomplishment that will be worth celebrating. I am going to be doing this project along with you, and honestly, I can think of several other things I would rather do instead. All of those other things would indicate denial of the issue--I have unfinished business and a real mess in my knitting storage areas. This may shock those of you who have decided that I have it all together, in which case let me reassure you that the state of my yarn piles is pretty bad. In point of fact, it tends to overwhelm me because if I had to go right now and look for a certain yarn, I know that bags of yarn (never the yarn I'm looking for, of course) will unceremoniously dump out of my antique armoire (which surely deserves better than this) and make a huge mess on the floor that is both shameful and frightening. As hard is it feels like it's going to be, I'm going to pull out the big guns here and quote The Eleanor Roosevelt: "You must do the things you think you cannot do." With her words to under gird us, well, let's do this thing. Step 1: Search and rescue. I think this one may be painful. Go find all of the knitting projects that you have stuffed in bags, in closets, under the bed, etc. All of them. Step 2: Line up and evaluate. Taking each unfinished project one at a time, make a list (either written or electronic). On the list, put the name of the project, who it is being made for, and your estimate of completion percentage. Step 3: Cull. I know this one will be painful. Examine closely each project. Be honest. Be brutal. Are they any that frankly don't deserve to take up valuable real estate? Would they (and you) be better off if they were, well, FROGGED??? Then do it. It's hard, I know. Do it and don't look back. You have better things in store and so does the yarn. And the needles! Step 4: Evaluate what's left after the culling. Adjust your written list as necessary. Step 5: Take a break. You deserve it. But do NOT spend your break time trolling for patterns on Ravelry. Step 6: Find the item on your list that will be easiest to finish first. Number the list in order of completion percentage. EXCEPTIONS: Items that have a gift-giving deadline that will fall within the parameters of your being able to finish the project. For example, if you have a scarf that you want to give your sister in Minnesota on her birthday in 2 weeks, and you estimate that you can finish the scarf in a week and a half, finish that first, even if you have a lace bookmark with no deadline that will take you only a week. As you finish the projects that take the least amount of time, you will give yourself the momentum to keep going, as you see that you CAN do it. Step 7: I can't believe I have to say this to you, because by now you KNOW me and really this should be something you hear me say in your sleep already. Seriously. Yesterday, I was so exhausted during the short time that I was home (and not cooking) that I only had time and energy to knit a few rows on a scarf, but there was no way I was going to let the busyness of the day rob me of what I love. There's so much value in plugging away at something consistently, every day, without fail. I know I say this a lot but until every knitter hears, I will keep on saying it. Knit everyday. This is how you will finish those projects that you have dug out of hiding and listed and gone to all the trouble in the first place to even start! Since you have dug out all the knitting storage, go ahead and sort through the yarn. 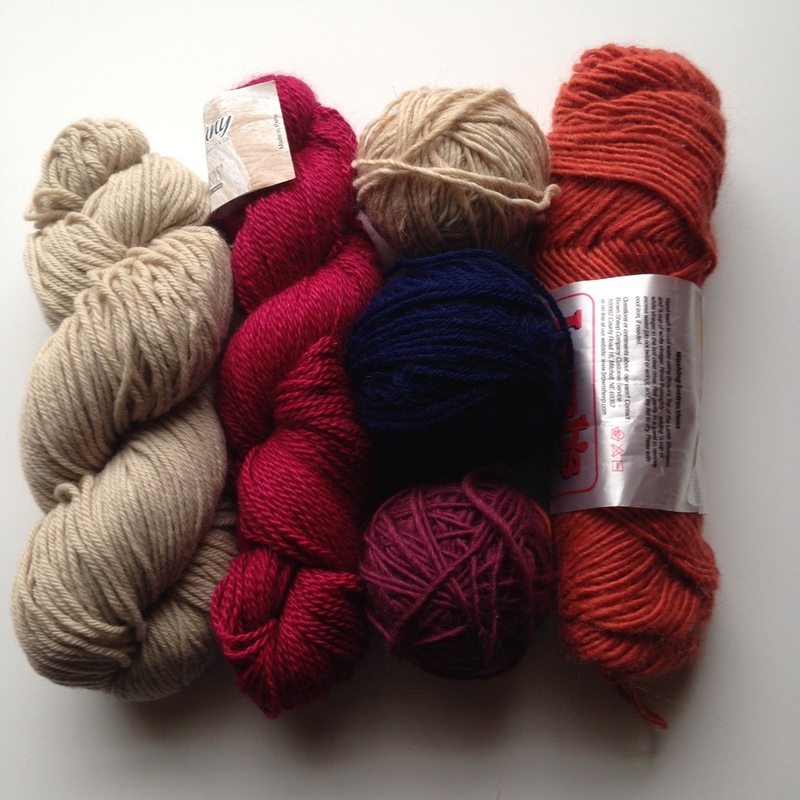 Is there yarn you regret buying or acquiring? It's ok to let it go--sell it, donate it, trade it, just get that negative thing out of your home. 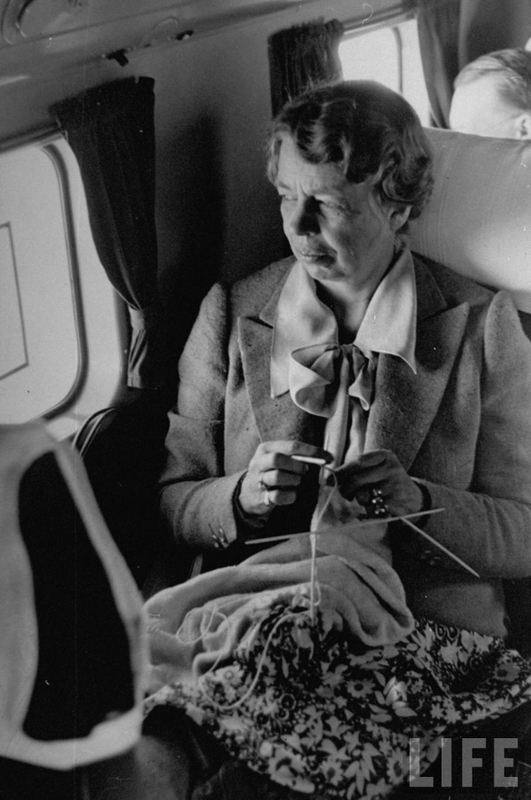 Knitting should be a lot of things, but "full of regret" is not one of them. Is there yarn that needs to be listed in your stash on Ravelry (yep, pretty much ALL of mine)? Then set aside some time to get that done, too. Are there too many storage spots in your home that lead you to buy more yarn or needles because you forgot you had them because that closet is kinda dark in the back and you didn't want to dig through that bag anyway so it's just easier to buy more (hypothetically speaking)? Time to get it together and find out what's really back there. You may find yet another UFO, but now you'll know what to do with it. That's it. That's all there is to it. It is no doubt easier to read (and type) than to do. However, I'm off to my storage spots now (and there are many) and I'm going to forge ahead in the spirit of Eleanor, who tackled worse obstacles than my crazy pile of UFO's. Check back next week for an update on my progress. If you're planning to Finish for Fall along with me, leave a note in the comments--just say "I'm in" and I'll know I'm not alone.